The way we work is constantly evolving. The idea of a traditional workforce has changed forever and for organisations today it’s more important than ever to stay agile and embrace the mobility revolution. Flexible working can bring a healthier balance of work and home life for your people, allowing them to stay productive anywhere and maximise their working day. New technologies have enabled greater mobility and are shaping the business landscape. Mobile and flexible working is increasing because of dispersed business locations, the need for convenience for your people, and increasing environmental pressures to reduce the need for transport and travel. A flexible network that can scale to suit your business needs, and cope with a high number of mobile users, is essential to support the Next Gen workforce. Investing in the latest network is only the first step you need to take to prepare for the future though. Making sure that your users have modern devices and accessories to do their job, and that you have the most effective way to manage and control your IT estate is equally as important to prepare your business for Next Gen working. Read on to find out how we can help. Aruba can help your business become mobile ready. Aruba offers solutions that transform aged offices into the office of the future. With more and more employees using smartphones, tablets and IoT devices, employees have the best devices to collaborate and communicate with others, but your business needs to adapt to cloud-based apps. With an Aruba solution, you can guarantee your business will be prepared for the next generation of working. Aruba recently conducted a study with 7,000 employees participating, across 15 countries. The aim of this study was to explore the current attitudes towards digital working, its benefits and how it affects worker behaviour. Of the 7,000 participants, there was a clear divide between ‘Digital Revolutionaries’ - employees who work in fully enabled digital workplaces where new workplace technologies are in widespread use – and ‘Digital Laggards’ – those who work in less engaged workplaces. By investing in a network that can handle the demands of a mobile workplace, you’re preparing your organisation for the future and giving your users the tools they need to be more productive and perform at their best, whilst remaining happy and engaged. DrayTek provides a single Wi-Fi network across multiple access points. Enabling your employees and guests to log on in one part of the network, then move around without losing their connection. Install DrayTek access points in optimum locations and you can manage them all centrally. Ensure coverage across your whole site without worrying about your people being able to get online. With a mobile workforce comes new network demands that could be more complex and expensive to run. The M4300 series delivers cost-effective services that are resilient and flexible. Perfect for wireless access, unified communications and IP video, the NETGEAR M4300 Switch Series will equip you for future workers. When it comes to devices there are hundreds of options out there. But which will be the best fit for your workforce? We've pulled together a selection of some of the best Next Gen devices from our top vendors. With extra security, long battery life and customisable features, your organisation and your users can rely on them to keep you productive and protected. HP Z workstations are built for mobile workers who need the power, speed and lightweight devices to be productive. They're built for specialists. Architects, Graphic designers, VR developer and video editors are just some of the kind of workers who’ll benefit from the Z range. Perfect for real-time simulation-based design with server-grade processors, high-end graphics, and lots of memory. Get the performance of a desktop with the freedom of a laptop. With relentless performance when editing multiple streams of content, manipulating data and developing in VR. Wherever business takes you, set a new benchmark for mobile working. Be productive in any situation. Windows 10 Pro2 and powerful security, collaboration, and connectivity features from HP help you power through your day. Work with confidence. HP ZBook 17 has been tested and certified for peak performance with leading software applications from Adobe, Autodesk, SolidWorks and more. A swipe of a finger closes the shutter on the HP Privacy Camera3, and a touch of a button activates HP Sure View4 privacy screen to protect against visual hacking. Confidently take your work on-location knowing your ZBook 17 was built for 24x7x365 workloads and designed to pass rigorous military standard tests 5. With its stunning new look, the ultralight ThinkPad X1 Carbon is elegant in design, has seamless responsiveness and legendary durability to create the ultimate in mobile productivity. Global LTE-A connectivity option, up to 15 hours of battery life—along with RapidCharge technology—means your users stay on-task wherever they’re working. What's more, it weighs less than 1.13 kg making it really easy to use on-the-go. Helping you get the most out of your technology investment. Warranty Upgrades and Extensions enable you to vary response time and level of service to match critical support needs. These options can be selected at the time of purchase or within the term of initial base warranty coverage. Depending on the initial base warranty of the system, service plans are available with customer-centric service levels designed to help your business. 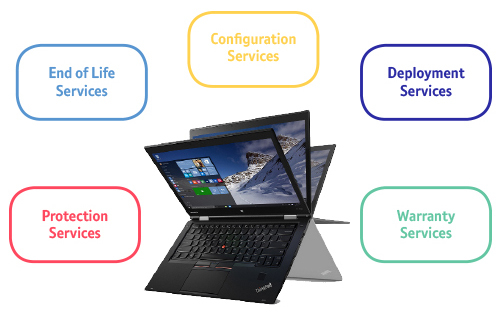 Premier Support connects your organisation directly with Lenovo's advanced technicians, who will provide hardware and software support with unscripted trouble-shooting, end-to-end case and relationship management, and prioritised parts and labour response when required. Choose the right device to meet your needs. The 12.5” Portégé X20W 2-in-1 instantly converts from a laptop to a pen-equipped tablet, while the 13.3” Portégé X30 laptop weighing just 1.05kg and with up to 18.5 hours battery life6 is perfect to keep your users mobile. Whichever device you choose, the X Series won’t let you down. All devices are supported by the Toshiba Reliability Guarantee. Your Laptop your way – meet the new Surface Pro 6 and Surface Laptop 2. With the latest 8th Gen Intel® Core™ quad-core powered processors, and all-day battery life7 for uninterrupted work and play. Surface Pro 6 is ultra-light and powerful – use it in tablet mode, or use the built-in kickstand with type cover as a laptop (type cover sold separately) that gives you more ways to work wherever and whenever you are. With the latest Intel® Core™, quad-core powered processor, you can guarantee speed, performance and up to 13.5 hours of battery life. Now in both platinum and black colour options it’s the perfect device for maximum mobility and productivity for every type of user in your organisation. Office 365 Business Premium gives you the ability to use all of your familiar applications, no matter where you are or what device you're using. Now it no longer matters if you use a PC, Mac, tablet or phone, you can access, share and store files so they’re always up to date. Office 365 Business Premium has all the features you need to confidently run your business. With lots of applications that are specifically designed to give your people all the tools they need to collaborate, and bring people together making sure that teams can organise and push projects to fruition. No need to pay for upgraded versions, with Office 365 Business Premium all regular updates from Microsoft are included in the package. Meaning you can concentrate on running your business and not worry about your applications. Security is of the highest importance for all businesses now and with cutting-edge security features built into the package utilising 5 layers of proactive monitoring and security practises, you can be sure that your data is safe from cyber threats. Technology now has the single greatest impact on a business’s ability to react, revolutionise and succeed. Today’s industry leaders have embraced this, and transformed their organisations. Of course, everyone uses technology to transform in different ways, but Dell believe customers can take four approaches to ensure success: Digital Transformation, IT Transformation, Workforce Transformation and Security Transformation. Whatever approach they take, companies of all sizes have gained new capabilities, new value and competitive advantages that have changed the game. See how Dell Technologies have transformed the way Jaguar work and have taken them to the next level of technology. Across all of the Dell Technology brands, they offer everything from devices to servers to cloud software. As a Dell Platinum Partner, we can offer a full range of solutions and can help with any type of transformation you want to take your business through. We don’t just provide the devices, we can help you deploy and control your device estate too. MIL-STD-810G testing is pending. Testing is not intended to demonstrate fitness of U.S. Department of Defense (DoD) contract requirements or for military use. Test results are not a guarantee of future performance under these test conditions. Accidental Damage Protection Care Pack. Surface Pro 6 battery life: Up to 13.5 hours of video playback. Testing conducted by Microsoft in September 2018 using preproduction Intel® Core™ i5, 256GB, 8 GB RAM device. Testing consisted of full battery discharge during video playback. All settings were default except: Wi-Fi was associated with a network and Auto-Brightness disabled. Battery life varies significantly with settings, usage, and other factors. Surface Laptop 2 battery life: Up to 14.5 hours of video playback. Testing conducted by Microsoft in September 2018 using preproduction Intel Core i5, 256GB, 8GB RAM devices. Testing consisted of full battery discharge during video playback. All settings were default except: Wi-Fi was associated with a network and Auto-Brightness disabled. Battery life varies significantly with settings, usage and other factors.